YIN (passive, accepting side). Outside-In: Find a need and fill it. Before you can succeed in business, you have to know the industry and how it really works, and tailor your business model to the real people who inhabit the real world, however. Don't expect them to adjust their behavior and rules so that your idea will become reality. YANG (active, aggressive side). Inside-Out: → Be different. Find the difference that makes the difference and change the rules of the game. Successful make much more money than average ones because they found a way to tap into a need in the market. 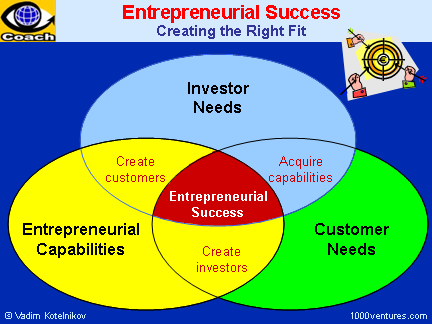 You need two attributes for succeeding as an entrepreneur: one, courage, second, luck.